When the eccentric matriarch of the Graham family dies, strange things start happening. The grandmother's shadow starts to loom over the lives of all the family members in ways hardly imaginable. A stylish, almost 'old school' psychological horror unlike anything you've seen recently. 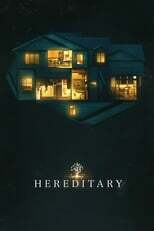 Hereditary is directed by Ari Aster and was released on Jun 8th, 2018. Director Ari Aster's Horror & Mystery movie Hereditary is produced by PalmStar Media & was released 2018-06-04.